Poultry and livestock production are becoming ever-increasingly important for feeding the 7 billion people that exist in today’s world. To meet this exponentially growing global demand, more than 50 billion chickens and 250 million turkeys are raised every year. Most of these chickens and turkeys are raised strictly for their meat (broilers) while the others (laying hens) contribute to egg production. In the United States alone, poultry meat production totals over 40 billion pounds annually; over four-fifths is broiler meat, most of the remainder is turkey meat, and a small fraction is other chicken meat. CAFOs, as defined by the Environmental Protection Agency EPA, is any “animal feeding operation that: (a) confines animals for more than 45 days during a growing season, (b) in an area that does not produce vegetation, and (c) meets certain size thresholds.” While there are only approximately 15,500 establishments that are classified as CAFOs, more than 250,000 animal feeding operations exist in the United States. The economic role of CAFOs has expanded significantly in the U.S. in the past few decades, and there is clear evidence that CAFOs have come to dominate animal production industries. Unfortunately, CAFOs release several types of gas emissions- ammonia, hydrogen sulfide, methane, and particulate matter- all of which have varying human and animal health risks. When enclosed in a confined area, these emissions (specifically ammonia) can increase to extremely toxic levels which have detrimental effects on the health, weight, feed conversion, and the immune system of livestock and poultry. Will ammonia really hurt broiler performance? It is a well-known fact that to achieve maximum performance and efficiencies in any CAFO or animal feeding operation it is critical to keep ammonia levels as low as possible, especially during the grow-out period. 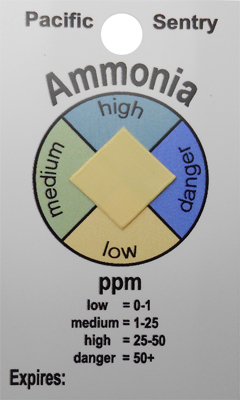 Many studies have been conducted proving that ammonia levels in excess of 25 ppm have a negative on poultry health. High ammonia levels correlate to increased susceptibility to disease, decreased yield and bird uniformity, reduced weight gains, and increased feed conversions. As demonstrated in the study below, an increase of ammonia from 0 to 50 ppm decreases bird weight by half a pound- translating into significant revenue loss for the grower. Total revenue loss = $19,920 per house, annually! * This model does not factor in losses from increased: disease instance, runts, condemnations and downgrades. The CAFO Ammonia Sensor offers a simple, visual indication of the average ammonia level present in the surrounding environment. 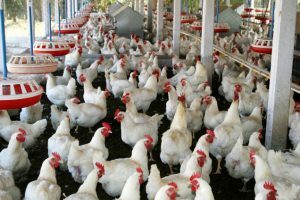 Whether you operate as a large-scale poultry broiler or small family-owned farm, this sensor will give you the ability to monitor your ammonia levels on a continuous basis. Simply attach the sensor in a convenient location (close to where the animals/birds are located) and observe color change. No longer rely on infrequent sampling with passive dosimeter tubes, gas detection tubes, electronic ammonia meters or the infamous “smell test”. The CAFO Ammonia Sensor will provide the information you need to easily determine if your poultry house, cattle farm or swine operation is functioning optimally and ammonia levels are being maintained to a minimum. Lower ammonia levels = Heavier poultry & livestock = More revenue! For more sophisticated ammonia detection and monitoring of your CAFO, Pacific Sentry can develop turnkey sensing solutions that minimize the involvement of the operator. Imagine being able to constantly monitor your farm or CAFO from any remote location; if ammonia levels exceed a certain concentration (30 ppm for example), an alert notice is automatically sent directly to your mobile phone so that corrective action can immediately be taken or ventilation fans automatically turned on. Please enquire about this service as it is still in development.